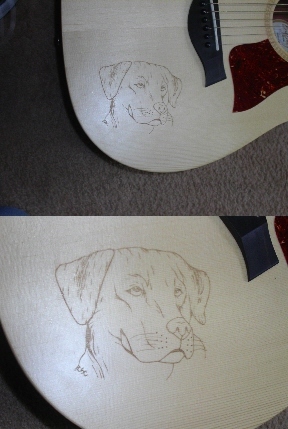 This is a hand-etched Labrador face on a Big Baby Taylor guitar. This carving was commissioned as a raffle item with the proceeds benefitting Friends of Homeless Animals. This is a hand-etched Taylor Big Baby. The satin finish that Taylor uses lends itself well to etchings. This was also produced as a donation to Friends of Homeless Aniamls. Another charity commission. This is a Maple rosette with Bloodwood dog paws. I did this as a raised rosette with the dog paws scrolled out of the Maple and the Bloodwood underneath. This gives the effect of actual recessed prints. This guitar was customized for Friends of Homeless Animals for a charity raffle, raising over $1200.OO for the charity. The Taylor GS Mini was customized with hand-carved Maple, Bloodwood, Walnut sound hole and headstock leaves. Matching bridge pins completed the guitar. I have always loved fall, with all of it's colors and leaf shapes. I am sure this will not be the last guitar I adorn with leaves. This guitar was customized for a charity Christmas Raffle. The guitar is a Breedlove Passport with a Bloodwood, Maple, Mahogany, Yellowheart soundhole insert depicting a dog and cat. The headstock has overlaid Maple pawprints and the bridge is decorated with dog and cat bridge pins. The raffle raised over $1,400.00 for Friends of Homeless Animals. Taylor Guitars donated this guitar which was raffled, the proceeds benefiting Friends of Homeless Animals. The guitar has a Cherry/Maple/Bubinga soundhole insert depicting two dogs and a heart. The guitar is also outfitted with dog paw bridge pins. I adorned this Kala Ukulele with hand-carved Maple, Bloodwood, and Yellowheart Hibiscus flowers in both the sound hole and headstock. Aloha! Paws began as a repair project. It is a Taylor 110 series guitar that was badly damaged in shipping. The guitar had five cracks in the top and a crushed area along the lower bout. I decided this would be a good repair project and I then donated the guitar to my favorite charity -- Friends of Homeless Animals. I removed the bridge, glued all of the cracks, and striped all of the finish off of the top. Since it then had no finish, and to help hide the crushed area, I decided to try my hand at a sunburst. While the neck and bridge were off of the guitar, I determined they needed paws as well. The bridge has recessed scroll cut paws and the neck heel has recessed carved paws. The soundhole has a revolving Purpleheart and Yellowheart paw inside of a Bloodwood and Maple heart. Finally, the headstock has five applied hearts. The guitar evolved from worthless scrap to a beautiful one-of-a-kind instrument. Most importantly, all proceeds will benefit homeless animals.